the lantern-jawed Batman of the late 1930s through the early '60s being only two examples. Andy Gump, then, was just about the least heroic-looking character in comics, with the possible exception of A. Mutt. He had absolutely no chin whatsoever. His neck was stuck right into his upper lip, and his mouth, when seen, was merely a hole near the top of it. The basic idea for Andy and his family was supplied by Captain Joseph M. Patterson, the Chicago Tribune editor/publisher whose many contributions to the world of comics include Moon Mullins, Winnie Winkle and Little Orphan Annie. He envisioned a domestic comedy strip about ordinary people — not too bright, not too rich, not too good-looking — and their ordinary adventures. He even came up with the name, The Gumps, "gump" being a term he used for a member of the Uneducated Masses. He hired cartoonist Sidney Smith, whose major credit to date was a billy goat named Old Doc Yak, to write and draw the strip, which began on February 12, 1917. It was Smith who fleshed out the characters and made them come to life. Andy was as heroic as his chin indicated. In times of stress, he would holler "Oh! Min!" — Min being his wife and pillar to lean on. They had a son named Chester, a wealthy Uncle Bim, and a maid named Tilda, who was absolutely insufferable. Smith started out just doing daily gags about life in and around the Gump household, but gradually moved toward longer and more complex storylines. Like Gasoline Alley (another strip Patterson strongly influenced, by the way), it became an early example of what later came to be known as a soap opera. A Sunday page was added on June 29, 1919. It was a popular strip right from the start. When, on June 16, 1919, Patterson launched The New York Daily News, The Gumps was the only Tribune strip that was in it right from the start. There, it attracted national attention among newspaper feature editors, a great many of whom wanted the strip for their own papers. It was to meet that demand, that Patterson formed The Chicago Tribune-New York News Syndicate — which, under the name Tribune Media Services, still distributes such comics as Broom-Hilda, Brenda Starr and Shoe. It also spawned imitators — one of the earliest and most imitative of which, The Nebbs, was launched by Sol Hess, who entered the comics field by writing dialog for The Gumps. Soon as the strip achieved national distribution, the merchandising kicked in. Sheet music in 1919 and 1923, a board game in 1924 and a proliferation of toys were only a few of the Gumps paraphernalia that could be had. On June 5, 1920, Andy's Dancing Lesson, the first of dozens of animated cartoons about the characters, was released. 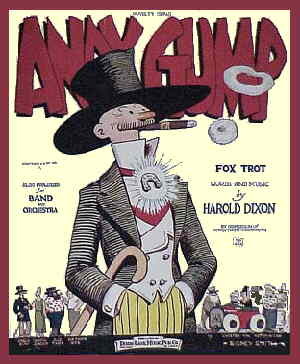 In 1931, The Gumps became the very first comic strip adapted into a radio show, when Chicago station WGN began broadcasting their adventures. The strip's popularity increased as Andy ran for Congress in 1922, and for president in practically every election from 1924 until the strip ended — one of a long succession of toon candidates for the Oval Office, beginning with A. Mutt in 1908 and eventually including Alfred E. Neuman, Betty Boop and Zippy the Pinhead. On April 30, 1929, a major character, Mary Gold, died — another comic strip first — and reader interest soared. All of a sudden, anything could happen. In 1922, Smith signed a highly publicized million-dollar contract — $100,000 per year for ten years, a vast sum in those days and a pretty good hunk of change even today. And it only went up from there — in '35, he signed a new contract, giving him $150,000 a year. It was on the way home from signing the latter that he wrecked his brand-new Rolls-Royce, killing himself in the process. Patterson hired sports cartoonist Gus Edson (who later co-created Dondi) to take over the strip, and Edson's work on it began appearing on December 16, 1935. Tho Edson made a reasonably successful attempt to continue it in Smith's style, his version of The Gumps wasn't nearly as popular as Smith's. Except for a few comic books from Dell and Big Little Books from Whitman (the latter featuring Andy's and Min's son, Chester), the merchandising dried up. The strip continued for a couple more decades, but circulation declined steadily. The plug was pulled on October 17, 1959. By that time, it was appearing in less than 20 papers. Text ©2001-05 Donald D. Markstein. Art © Tribune Media Services.